The short documentary, Pure Wisdom, is a selection of interviews from junior and senior classes (4 to 6 years of age) of Kilcommon National School, Tinahely, Co. Wicklow, about their opinions and thoughts regarding the environment, illegal dumping, litter, pollution, nature, etc. These interviews form a 10 minute production which is both insightful and enlightening, and on many occasions, humourous, but all are full of Wisdom. 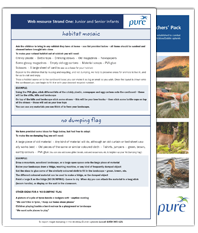 The PURE Primary Schools Teachers’ Pack is designed to provide primary school teachers with information and work sheets on environmental education. The education programme is divided into four sections and covers all classes in primary schools, i.e., each sheet is designed for two classes. All of the inserts can be printed, photocopied and distributed to students. The information and exercises are fun and interesting ways for children to learn about their natural environment, with stories, games, activities, word games, quizzes, simple class room experiments, and much, much more. The education pack was designed to accompany the current primary school curriculum and was distributed to all schools in Wicklow, South Dublin and Dun-Laoghaire Rathdown regions. If you have any queries or questions in relation to the Education Programme please feel free to contact the PURE project. For further interesting and fun ways to learn about the natural environment we have created an Education Resource Section where you will find more games, activities, etc.